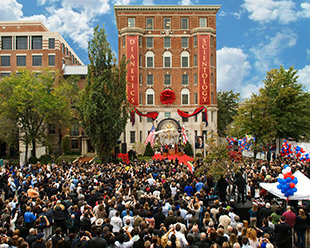 On October 31, 2009, three thousand Scientologists and guests attended the dedication and opening of the new Founding Church. The structure was fully restored as one of Washington’s premiere historical sites. Opening ceremonies began with a traditional military marching band rendition of Stars and Stripes Forever. 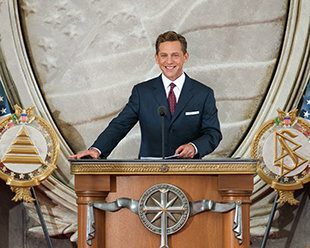 Mr. David Miscavige, Chairman of the Board and ecclesiastical leader of the Scientology religion, officiated at the dedication this day, inaugurating a new Church in the nation’s capital. Mr. Miscavige, joined by honored guests, officially opened the doors of the new Founding Church, which will serve the spiritual needs of its parishioners and offer unqualified help to the greater Washington, DC community as well. The original Founding Church of Scientology was established in Washington, DC in 1955 by L. Ron Hubbard. The address chosen for the new Church was on “Church Row,” just six blocks from the White House. The doors are always open and the reception area stands ready to welcome visitors in for introductory lectures, films and self-guided tours through the Public Information Center of the Founding Church. An extensive section of the Information Center is devoted to the Church’s many social betterment activities. Here visitors learn about global initiatives to eradicate drug abuse, ensure human rights and respond to disasters through the Scientology Volunteer Minister’s program. Visitors may also view a multimedia presentation of the life and legacy of Church Founder L. Ron Hubbard. These include interviews with those who knew and worked with him, and photographic essays of his professional achievements. The auditorium of the new Founding Church of Scientology of Washington, DC is used for congregational gatherings as well as serving as a Chapel for Sunday Services, Weddings and Naming Ceremonies. The Academy is comprised of six course rooms which will be able to provide training to hundreds of ministers and parishioners at a time. Located six blocks from the White House, the newly restored 49,000-square-foot building represents the largest-ever presence for Scientology in the nation’s capital, a presence that began in 1955 with establishment of the DC Church by Founder L. Ron Hubbard. Among those attending to honor the landmark day and addressing the gathering of more than 3,000 were the Honorable Brad Sherman, U.S. Congressman from California’s 27th District; Ms. Addie Richburg, President and Chairman of the Board of the National Alliance of Faith and Justice; Ms. Diana Rothe-Smith, Executive Director of the National Voluntary Organizations Active in Disaster (NVOAD); and Mr. Mike Silverstein, President of the Dupont Circle Advisory Neighborhood Commission, representing District of Columbia Mayor Adrian M. Fenty. But what made the day truly momentous was the presence and address by Mr. Miscavige who spoke of both L. Ron Hubbard’s and the Church’s long history in the nation’s capital. In particular, and in context of both American history and culture, he spoke of, “A Declaration of Independence, wherein it is written that all men are endowed with certain inalienable rights—including the right to life, liberty and the pursuit of happiness. “That the souls of men have the rights of men. “And that no agency less than God has the power to suspend or set aside those rights. “For that is what our Founder declared in the Creed of our Church. “So yes, you are looking at a living embodiment of the freedom and equality that originally inspired this nation. Because, yes, this Church stands for life, liberty and the pursuit of happiness. And, yes, it stands here today because of the freedom on which this nation was built—the freedom of religion. “For it was here, in this nation’s capital, that we fought for and won our recognition. And all which has made it possible for us to reach out the world over with our programs to bring the American dream of freedom to every being of every nation. With those words, and joined by the honored guests, Mr. Miscavige cut the ribbon, heralding a new era of freedom for all.